Thanks to my dear wife, my models are tidy, while… sometimes, the models (changing place) are a little broken, this is normal. 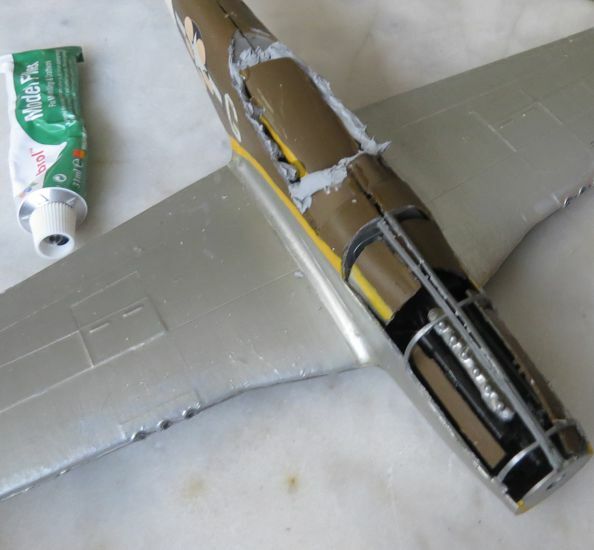 This P-51D at 1/32 scale has no more canopy/spinner/propeller, this is an opportunity to create a Mustang engine-less derivative. - 1st life (1977-2009) North American P-51D Mustang: this was a realist Mustang, the only “what-if” side was the bright orange face of the pilot. I was 13 year old and I had no flesh paint and stupidly I did not think of using brown paint for an afro-american pilot, this orange was “crazy” (a little less than green or blue but not much). - 2nd life (2009-2018) Native American P-51^; to be more what-if, I created the triangle tail, I hided the guns with white tape, and I invented modified roundels for United Tribes of Amerindia. - 3rd life (2018-3018 and beyond…) Mustata: the central cockpit will disappear, as the engine exhausts, the belly radiator, and there will be a nose glazed cockpit, probably the tail will change again, with canard foreplanes maybe. Paint: all sky blue probably. ... a Mustang engine-less derivative. Thanks for having found some explanation, like if I were not crazy! Good! Vorcha, you're a genius! You have, at a stroke, enabled all of us to do away with visible means of propulsion! Just think what aircraft would be, without engines and the requisite fuel tanks! Can you imagine how pretty the Concorde would have been without those big boxes under her wings? How would this work over enemy territory? Do these beams need only a projector, or does it need receptors as well? Do aircraft still need speed to generate lift? Hmmm ... many worms here, as with any new idea. But, huge potential! Following Tophe's work from now and then I got the impression that in his What-If world there seems to be no militaries anymore so I assume there would be no "enemy territory", that's for sure. Actually, I wasn't being sarcastic at all. I really think your theory has made possible a completely new level of Whiffery. In the '70s I read a book about a guy who invented a Sky Hook. It was powered by super-batteries which he loaded into his Piper - Cherokee, I think? - call-sign "22T" -> 'Two Two Tango'. He took off normally, engaged the Sky Hook, switched off the engine, and (on internal oxygen) climbed to airliner heights. He was seen by several, IIRC, who reported a Cherokee about 10K higher than its normal rating, with the prop stationary. The recording of the pilots' reports then forced the Powers That Be to take our hero seriously, and the Sky Hook went on to be Happily Ever After. I don't recall the name of the book, but someone may. °o° wow. thats a book I'd like to read. EDIT: there is a book on amazon called "Skyhook", but from the description it doesn't seem to be the book you're talking about. Makes me think of something like energy highways propelling vehicles from point A to point B Like George Jetson on his way to work. The energy current sweeping a vehicle along sounds good to me. Any way you look at it, it leaves tons of whiffing options! I say let’s get to it!